Whenever you choose a meal, you also evaluate the price alongside what meal of the day it is. For me I spend the least for breakfast, also minimal for lunch, and it is dinner where I have the propensity to spare no expense. But even when doing this evaluation I take a look at what I am getting, is the meal in proportion to the price, is the serving size they are giving worth it’s weight in potatoes. So when I went to Smorgasbord in Manhattan’s Seaport for lunch and chose to purchase lunch at Fletcher’s Brooklyn BBQ and spent $14.00 I weighed what I would get. What I got was a bbq pulled pork sandwich with a side of slaw, potato chips, and a bottle water. Now on the onset it seemed quite expensive for a lunch, but I thought maybe bbq is different here in New York, I mean when I go to Famous Dave’s BBQ for the same thing I will spend $6.99. 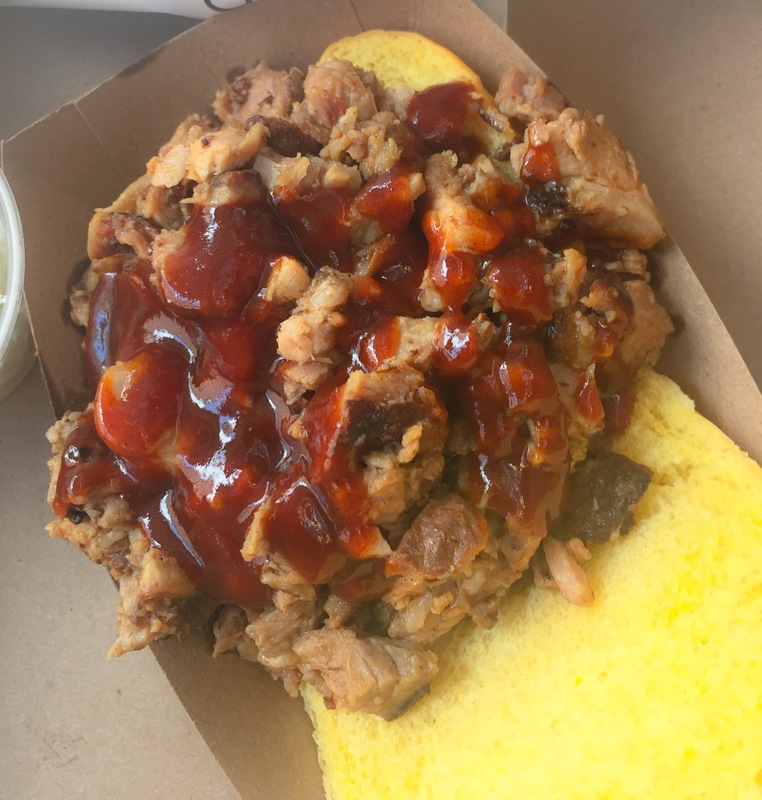 So it got me to thinking in light of the fact that I had never been to Fletcher Brooklyn BBQ, maybe the portion is bigger and more importantly maybe the taste is better than Famous Dave’s, so I will go on the splurge. Upon first sight and bite what I realized is that I had been hustled, I would even go as far as to write I had been hornswoogled. Whenever you eat bbq there a few key components that are extremely essential: tenderness, smokiness, and robust flavor, and only one of the essentials were fulfilled and that was the tenderness. 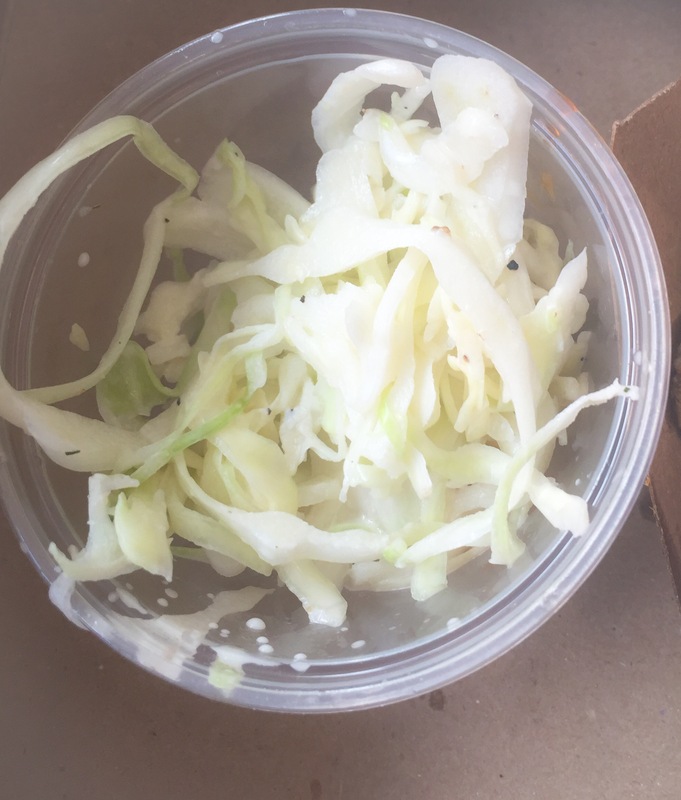 The slaw was just simply shredded cabbage, no sauce, no flavor, just a ketchup size cup of shredded cabbage, so insignificant that it seemed unfair to call it slaw. In my mind I was chanting a song “Oh smokiness, oh smokiness, where art thou!” Maybe Fletcher forgot it, maybe Fletcher cooked this pulled pork in a crock pot and tried to give me the 52 fake out and call it bbq, or maybe this was simply subpar bbq with a Manhattan price, where the establishment hadn’t decided that for $14.00 for lunch it should be absolutely superb and mouth shattering good. A meal where when the splurge is made, the eater feels like this sandwich was absolutely worth every penny and its weight in potatoes. 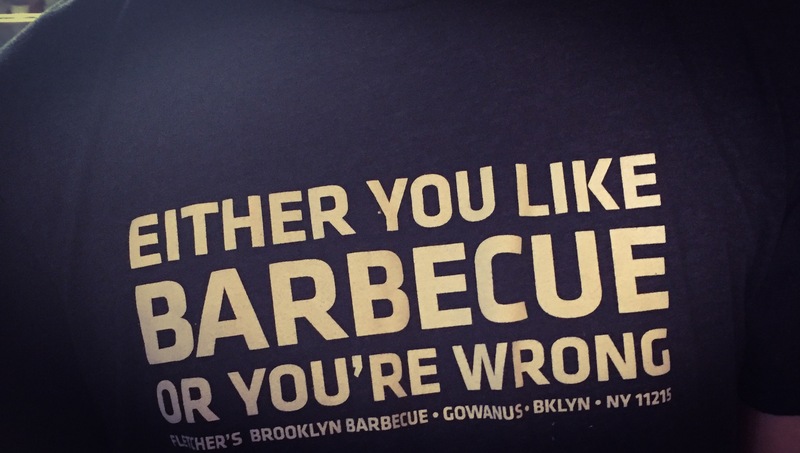 Fletcher’s Brooklyn BBQ maybe you need to take a lesson from Famous Dave’s and make me imagine that with every bite a big fat man is out in the back slow cooking bbq with cedar wood chips and coals, because it’s simply that good. Wow I would have expected better.